Knitting :: The very beginnings of a new shawl design, in a new yarn base I’m testing out for Agrestal. This yarn is so squishy and warm – it’s a softspun single ply sportweight and I’m already dreaming of so many projects for it. These colours were dyed using various combinations of marigold, chestnut, cream of tartar, and iron. 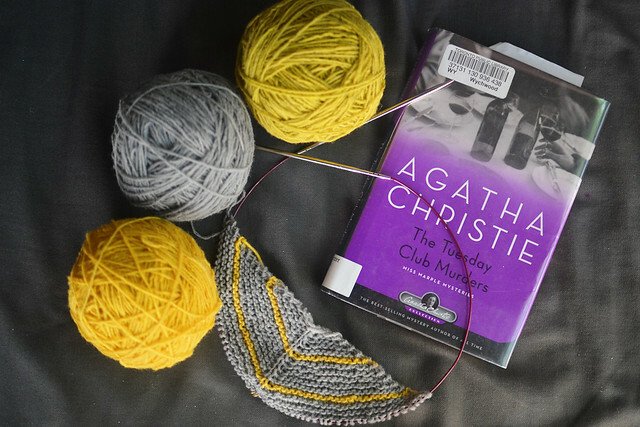 Reading :: I just picked up another Agatha Christie from the library, though I haven’t had the chance to start it yet. This one should be fun – it’s a collection of short stories from the Miss Marple series. Watching :: The Bridge on Netflix. It’s a Swedish / Danish crime drama and it’s so well done – the atmosphere created by the filming style and the acting is just superb. The plot is really captivating too. This is in Swedish with subtitles. Listening :: To a bunch of podcasts, as usual. Invisibilia is back, and it’s wonderful and thought provoking as always. I also started listening to More Perfect, which is about cases from the US Supreme Court. I know next to nothing about American law, but this has been absolutely fascinating. It’s done by the same folks who do WNYC’s Radiolab, so production and research quality is excellent. 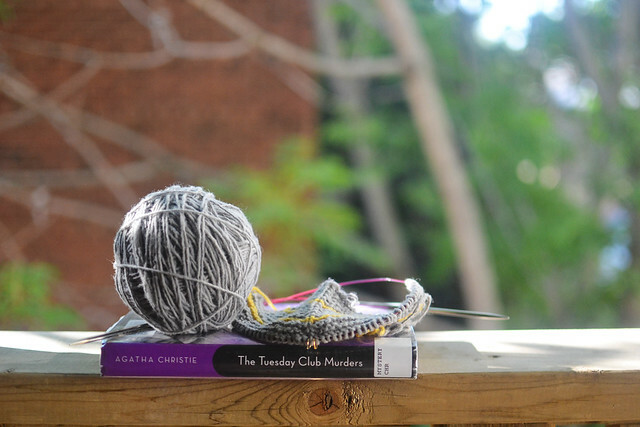 Linking up with KCCO and Yarn-Along this morning. That new base looks so wonderfully squishy and rustic! And, of course, I love the grellow combination you are working with. Dyeing is on hold until the weekend for me – the apartment is way too hot as it is! Thanks Brandy! And yes- I will always take moody crime drama recommendations. Crime shows are my favourite. I totally agree – way too hot for dyeing today. I managed to get in a long session on Monday though. We should meet up for knitting and catch up soon. 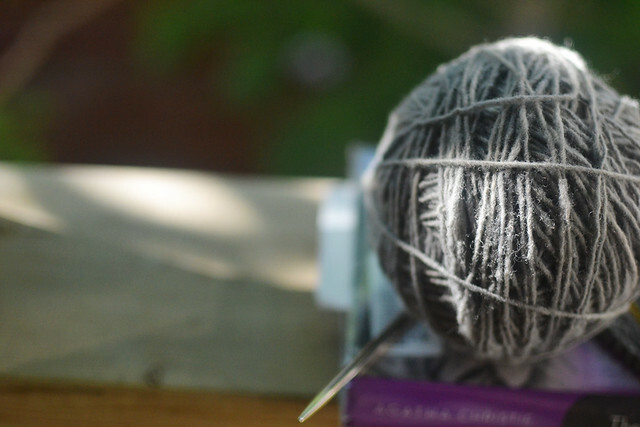 I’d also love to do a skein swap with you sometime if that’s something you’d be interested in. I love those colors of that yarn! I can’t wait to see how your project turns out! And, I loved The Bridge so much! Excellent viewing! Thanks Kat! Hope you are enjoying your week so far! Thanks Karen! I love gray yarn too… it’s a tricky colour to natural dye so I spent forever perfecting this one, and I’m so pleased with the final colour! Are you carrying the yellow or it seems like you’ve cut each time since there is only a row now and then? Trying to start my niece’s Christmas present and I finished Rick Riordan’s Apollo book. 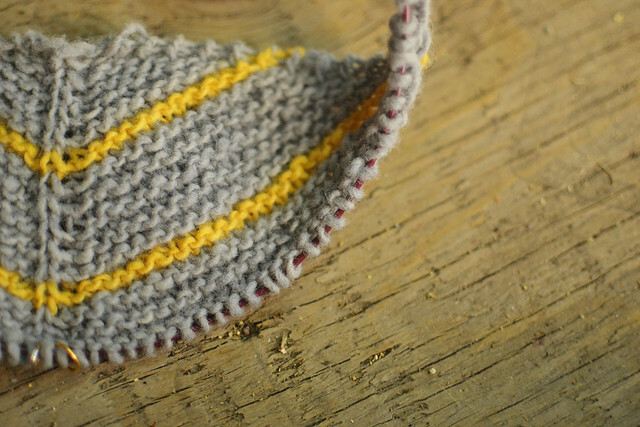 Love the gray and yellow! Two of my favorite shades together. I too am really into grays these days…. yarns that is – LOL! I’ve got so many projects going (one being the Pincha shawl)…. and I’ve always got tons of books going! I just pick up whatever book fits my mood…. Thanks Linda – it’s one of my all time favourite colour combinations too! Hope you are having a lovely week. I am always on the lookout for new, quality podcasts lately. Both of those sound really interesting, so thanks for the recommendations! Have you listened to Revisionist History at all? The new base is beautiful and looks to be knitting up like a dream! I always enjoy a wonderful Agatha Christie book and it has been a while, so thank you for the reminder. Wonderful taste in podcasts as I love Invisibilia and More Perfect.